Spiritual Practice with Zendala Dare #50 - Minette Riordan, Ph.D. Earlier this week I wrote about recognizing that creativity is my spiritual practice. It plays out in so many different ways for me: my love of everything Zentangle®, my new love affair with SoulCollage®, my journaling and painting, walks on the beach or rides in the car. My list of where I find my creative inspiration is limitless as long as I continue to see what’s in front of me. Being in touch with my creative spirit, I am constantly feeling inspired to create. I even find myself paying more attention to what I am eating and enjoying the beautiful colors of the fruits and vegetables I prepare. I carry my iPhone every where so I can snap pictures of what I see or take notes on random creative thoughts that arise. I loved the template for Zendala Dare #50 and you can download you own copy here or get inspired by the many other templates shared by Erin on her blog The Bright Owl. This is my first time to participate in the Zendala dare, but I can see this becoming a new addiction and inspiration to create a new Zendala each week. Zendalas combine two of my favorite things: Zentangle® and mandalas. I was talking to a friend on the phone this morning and reminiscing about the joy of coloring. 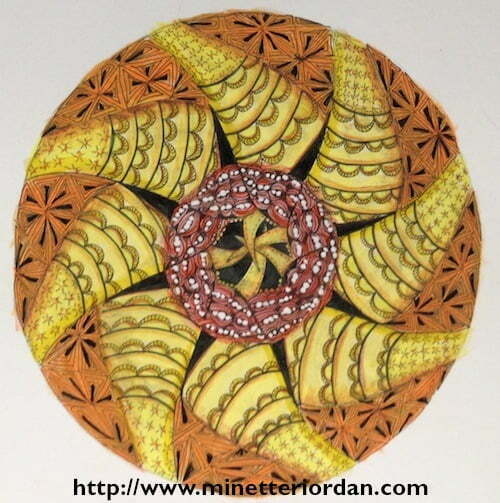 For years, the kids and I have enjoyed coloring mandalas together. Just this past Sunday as I worked on this Zendala, they pulled out some of our mandala coloring books and started coloring. We enjoyed the quiet, peaceful time together and I love seeing what colors they choose. After I finishing tangling the Zendala template, I let it sit for a day, debating whether or not to add color. As I looked at it, I got a clear message to add red, orange and yellow. I needed the warmth and glow of these colors in my life right now. I have learned to trust these intuitive urges in my creative process and to not judge the outcome. I just listen and follow the nudges. I find that my willingness to let go of judgement has allowed me to enjoy art and I find my own work more pleasing to my eye, and that’s all that really matters. Another friend asked if I was framing my Zendalas and hanging them up. I just laughed. Most of them are just piled in the craft closet. Sometimes I give them away, most of the time I just forget about them. I did hang up my green spring Zendala with thumb tacks, no fancy frame. I am starting to share them on Flicker and Pinterest and finding it’s a challenge to put them out into the world. While I have released my own inner critic, part of me still fears the judgement of others. But I am pushing through the fear and sharing anyway. Art makes me happy. The more time I spend cultivating my relationship to the divine, the more grounded I am and in touch with my inner world and my connection to the world around me. Zentangle® is one of the processes that I use to help others reawaken their creative spirits and remember how to be creative. Creativity is a spiritual practice but it is also a habit that needs to be cultivated, tended and loved. Would you like more help and some fun, easy-to-follow lessons on using creativity as a spiritual practice in your life? I am offering an 8 week virtual workshop called Artful Meditation. This is perfect for any who loves art and journaling and would like to create a more mindful approach to your creative and spiritual practice. Perfect for beginners wanting to learn to meditate or those who want to deepen and expand their meditation practice. Click here to get all the details and sign up today. Cost is only $47.00! I have been known to take some crazy pictures with my iphone. You just never know when you will see something that will trigger that creative side! I’m right there with you on that! Fab post, love it. I love creating mandalas and the idea that creativity is a spiritual practice is core to what I’m doing at the moment. Well done for sharing them too, I know what it’s like to face the fear of criticism. I can totally relate to your post. Even though I am a grown adult I love to color! I find it very relaxing and never considered the spiritual connection. Thanks. I will check out the Zentangles. I enjoyed your post and can relate. I too love coloring and never considered the spiritual aspect. It is very relaxing. I will check out the Zentangles.